World Wrestling Entertainment (WWE) is the largest, most popular American company in the Professional Wrestling and Sports Entertainment industry. Originally known as World Wrestling Federation (WWF), the company was founded by partners Jess McMahon and Toots Mondt in 1952. The company is known for producing scripted shows with pre-planned settings and fighting techniques, though projected as genuine bouts. The company is coming up with brand new thrilling live shows in your city. You can get WWE Live tickets from our website now. WWE stocks are traded publicly and major sources of income include live shows, music, films and product licensing. In 2011 the company rebranded itself as WWE after a lawsuit was filed by World Wildlife Fund for same abbreviations. The company owns active properties like WWE Libraries, WWE Studios, WWE Music Group and WWE Books that contribute to the recognition and boosted the image of the company. These properties have also been generating income for the company in one way or the other. World Wrestling Entertainment’s classic history has been offering different championships to promote the new talent. Out of these championships, WWE Championship, Intercontinental Championship and World Heavy Weight Championship are notice worthy. Such events have been serving as the most recognized and acknowledged platform for champions like John Cena, Dolph Ziggler and Wade Barret. The company has also been honoring its retired champions at different occasions and events. The years 1980-1992 have been marked as a golden period of WWE as the broadcasting of wrestling shows caught a boom. With the introduction of Hulk Hogan as a new striking face of the company, WWE adopted its new image as an entertainment provider unlike its former image as actual sport broadcaster. As the time changed, WWE changed with it and kept up pace with the advancements that the international or the world media went through. This probably became the reason for the astounding success of the company and gained its repute of an up to date organization. In the following years of revolution, WWE again took drastic steps to alter its outlook from family-oriented to individualistic, rugged and tough image. All of the heroes and faces in the shows portrayed a "bad guy" image which greatly inspired the youngsters and worked in favor of the company in the form of improved ratings. Such time period marks years from 1997 to 2001 and collectively known as "The Attitude Era". Besides all the changes that the company went through, it has maintained its reputation for being a premiere entertainment provider. The company has a valued legacy and it has served for the betterment for its heroes and names associated with its community. World’s leading organization for entertaining wrestling shows is now set for a series of energized shows in your city. Buy WWE Live tickets from our website to attend a thrilling event. Hurry up and book tickets now. With WrestleMania 33 just around the corner, the stakes at every WWE live event will be higher than ever. WWE’s latest pay per view, Fastlane, set up some exciting matches for WrestleMania with super stars like Goldberg and the Undertaker now involved in matches. You can expect these feuds to rapidly gain momentum at each and every WWE live show. Catch both WWE Smackdown and Raw along with other house shows as the Road to WrestleMania comes close to its destination. To watch the shows live from the arenas, get WWE Live tickets today. The SummerSlam Heatwave Tour will come to various arenas as part of the buildup to WWE's SummerSlam pay-per-view. Fans will get the chance to see their favorites WWE superstars and interact with them. SummerSlam event is the second biggest annual pay-per-view event on the company's calendar. It was held at the Staples Center every year between 2009 and 2014. Since the year 2015, it has been held at the Barclays Center and that is where the latest edition will take place too. The fans can look forward to seeing plenty of exciting matches at the event. But before that, they can enjoy all the buildup to the event by booking their SummerSlam Heatwave Tour tickets. Wrestling season is here and is packed with epic matchups. You can catch all the action live as it happens. Next event featuring WWE Live will be WWE: Live, held at the Enterprise Center in St. Louis. As of now, the last event, WWE: Live is scheduled for 13-Sep-19 at the UTC Mckenzie Arena in Chattanooga. For complete itinerary of events, please visit our website. The average price for WWE Live Tickets start from $51. The minimum get in price is $14 for WWE Live Tickets at the Southeastern Kentucky Agricultural And Exposition Center, Corbin. For a detailed look at ticket prices and amazing discounts, visit our website. Use Event18 as the discount code and get up to 70% discount on WWE Live tickets. This is a last minute opportunity to get the discounted tickets for WWE Live. Q:Will I be given a discount if I purchase the wwe live tickets 2018 from your website? A:We have no say in this as it is up to our certified brokers to offer you a discount. Our reliable brokers are the ones who are offering WWE Live Tickets on our website and they are priced economically. If you don't want to miss out on all the high octane action then place your order now by going to the event's page of our website and you may just get a discount. Q:How much will it cost me to watch wwe live events? A:WWE Live are in house shows that are held in relatively smaller venues and for small crowds. WWE Live shows keep the focus solely on wrestling and that is something that makes these shows worth watching. The highest average Wwe Live Tickets price right now is $217 while the lowest average price is $100. The highest get in price is $46 whereas the lowest get in price is just $22. So, if you want to watch your favorite superstars live, then book your Wwe Live Tickets from our brokers now. Q:Where can I find wwe live dates? A:WWE Live events are held all through the year in different venues all around the country. The latest season of WWE Live events is well underway now and you can check the schedule on our website. If you are a wrestling fan and wan to attend a WWE Live show, then you can also book your Wwe Live Tickets from our brokers via our website. The tickets prices are very competitive and you can watch your favorite superstars in action without putting too much pressure on your wallet. Q:What is the wwe live lineup? A:WWE Live shows are held all through the year and hence the lineup for every show changes. At times, the company announces a particular lineup for a particular show but due to unforeseen reasons like injuries, the lineup can change beforehand. The company does try to make sure that the fans get to see some big name stars from their rosters in WWE Live shows. So, if you want to do the same, then book your Wwe Live Tickets. Q:Do you have wwe live presale tickets? A:We are sorry but we don't normally have presale tickets for any event and the same goes for Wwe Live Tickets. But there are certain cases, when we do get a few presale tickets for a particular event. So, if you are looking for presale Wwe Live Tickets, then we would request you to check our website on a regular basis to see if those are available. Q:How much does it cost to buy a WWE ticket? A:The price of WWE Live Tickets varies from city to city. The average lowest price is $92 and the most expensive tickets are averaging at $203. The minimum get-in-price is $8. It's best if you search through the inventory, check the prices in your city and book your tickets accordingly. Q:Can I have my wwe events 2018 tickets refunded? A:WWE is without a doubt one the biggest professional wrestling organization in the world. WWE Live events are in house events arranged by the WWE to give fans a different experience. Since these events are smaller in scale than normal weekly events and pay per view shows, the tickets are always in demand. If you want to have your Wwe Live Tickets refunded, we would suggest you make sure you want to do that because tickets refunds are not normally allowed. For more information, read through the "policies" page on our website. Q:I am willing to buy Wwe Live 2018 Tickets from your website. Can you please tell me how much will I be charged? A:You can purchase your Wwe Live Tickets from our website at best rates. Our brokers are offering them at different prices. Just go on to the event's section of our website and you will find the list of prices that you can pay for the tickets. Q:I am searching for wwe live holiday tour tickets. Are you offering them? A:Yes we are. Simply visit our website and go the events page where you will find all the available Wwe Live Tickets along with their prices. Go through them and choose the one you like. Q:Can you please tell me the wwe schedule 2018? A:If you want to watch heart pounding action in person then buy your Wwe Live Tickets from our brokers today. You can check the WWE schedule for 2018 on the event's page. A:WWE Live is a series of in house events by the World Wrestling Entertainment. There is not much talking but there is a lot of in ring action at these shows. Book your Wwe Live Tickets from our brokers and watch your favorite superstars live. Q:What is the price of tickets for wwe live holiday tour 2016? A:Our trusted brokers offer Wwe Live Tickets in a range of prices. Simply visit the event's page and you will find a list of available tickets. Browse through the tickets and choose the ones which best suit your budget. You can then purchase the tickets by following a few simple steps. Q:How much tickets for wwe live can I buy at a time? Q:Will I be able to buy wwe live shows tickets on the day of the event? 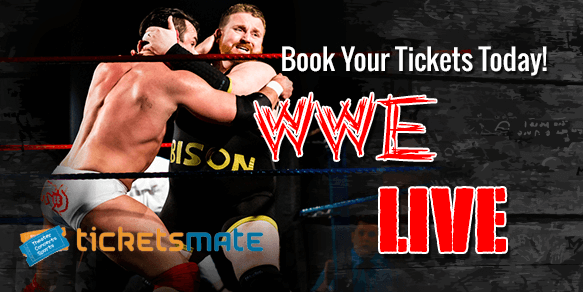 A:The Wwe Live Tickets you see on our website have been put up there by our brokers and they are offering tickets on first come first serve basis. Yes, you will be able to buy your tickets on the day of the event but only if they are available and not sold-out by then. It is always a risk putting off your purchase till the last day and always better to get your tickets as soon as possible. Q:Is it safe to buy Wwe Live 2018 Tickets from your website? A:Yes, it is perfectly safe to purchase Wwe Live Tickets from our website via our certified brokers. We have been certified as safe by leading internet regulatory authorities and our website is protected by state of the art protection software. Please rest assured that all transactions you make with us will be conducted in a legal and safe manner. Q:Where can I get information about the wwe live holiday tour 2016 schedule? A:The entire schedule regarding WWE Live events as well as the Wwe Live Tickets is now available on our website. All you need to do is log on to our homepage and navigate to the relevant event's page to get all the information you want. Once you are done with that, just follow a few simple steps to get your tickets from us in just a matter of a few minutes. Q:Where can I get the wwe live holiday tour reviews? A:You can get all the information you need about Wwe Live Tickets and the events from our website. Complete details are now available on the relevant WWE pages for you to go through. You can also book your tickets from there by following a few simple steps.